I was born and bred in earthquake country. Now, no matter who tells you this, never believe them: "I'm used to earthquakes." It's not true. No one's used to earthquakes. They come unannounced, the great leveler of all society. No one's immune, no one's safe, unless they're up in an airplane. Sylmar, Landers, Big Bear--luckily not Loma Prieta or Northridge--I've experienced my fair share. Earthquakes remind you you're not in control, that forces bigger than you can change your life in a heartbeat. "And you will hear of wars and rumors of wars; see that you are not alarmed; for this must take place, but the end is not yet. For nation will rise against nation, and kingdom against kingdom, and there will be famines and earthquakes in various places: all this is but the beginning of the birth pangs" (Matthew 24:8). Wonderfully vague, but pointed just the same, Jesus reminds us that the world as we know it will not continue forever. New life is stirring. Christ's kingdom is spreading. History will come to its appointed conclusion. And God declares, as we read it in the last book of the Bible, "Behold, I am making all things new." Earthquakes. Birth pangs. New life. Outside my window the ground is covered in wet, spring snow. The buds on the aspen tree are barely visible. The brave daffodils boldly poking from the ground are entombed again in heavy wetness. Unwelcome for now, perhaps. But give it some time. It's cold now. But spring is coming. Life is emerging. And it will come whether we welcome it or not, whether we're ready or not. Life triumphs over death. That's our Lenten reminder, our Easter hope. That's the object lesson of this change of seasons today. Birth pangs. New life. Are you getting ready? 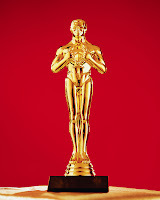 Was it just me, or did anyone else feel the Oscars were a bit...lacking? Honestly, I'm starting to feel toward the Academy Awards the way I've felt now for two seasons towards "American Idol"--tired and uninspired. Both of these shows are slavishly working the template with minor innovations year to year. They don't seem to be trying very hard. Even worse, both offerings strike me as self-indulgent. One almost gets the sense that Oscar and Idol coast along on an air of entitlement: "We're the best and we will do what we please. You may watch us." Ugh. The highlight of last night's awards ceremony, for me, was the modern dance number. Man, what acrobatics! I found myself applauding aloud in the family room. That was a great moment. Steve and Alec's shtick was okay (I'm an old Steve Martin fan and I tend to enjoy Alec in 30 Rock). The lowlight for me was seeing the cosmetic flaws of the celebrities. I've renamed HD TV "AGE-D TV" as a result. It was a good reminder of our collective mortality. And it made me feel less ashamed of my own flaws. I guess the question I'm left with for last night's Oscar show was, "Is that the best they can do?" I'm thinking Oscar needs an Extreme Makeover. What do you think?